Hassan (Ahmad Mahmud) is ill treated by his foster mother but he finds hope and relief in his friendship with the village penghulu’s (headman) daughter Hasnah (Rosnani). He plays the flute so well that a particular tune (‘Chum Chum’, by the revered Malay composer Osman Ahmad) keeps Hasnah smitten through their teenage years until they grew up to be a loving couple. Unfortunately, Hassan and Hasnah’s relationship is frowned upon both by his foster mother and the penghulu. Hassan thus leaves for Singapore to earn a living and vows to return to marry Hasnah. 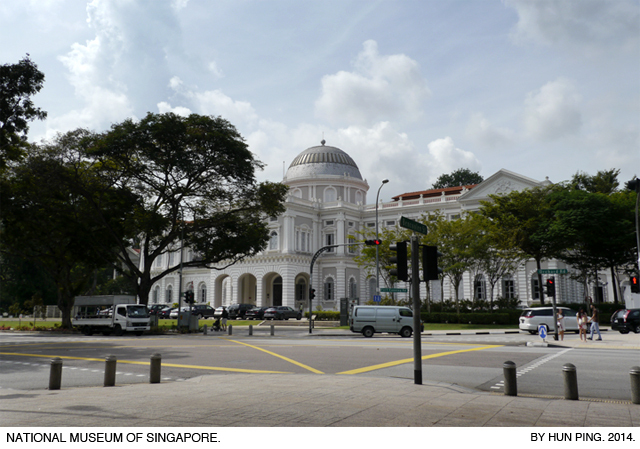 In colonial Singapore, he works as a janitor at the Raffles Library and Museum (renamed the National Museum in 1965 after Singapore turned independent). A fellow villager pays a visit to the museum and meets Hassan by coincidence. He informs Hassan that Hasnah’s parents have betrothed her to an aging widower and she has taken seriously ill in his absence. Hassan promptly takes a train (at the Tanjong Pagar Railway Station) back to his kampong, back to Hasnah’s arms. Then the film story delivers the ultimate twist, when it is revealed that Hassan is actually the widower’s long-lost son! The widower is gracious enough to step aside and gives his blessings to his son’s union with his former wife-to-be. A report in The Straits Times (4 June 1953, p. 8) stated that ‘more than 1800 Malayan pilgrims will leave Malaya for Mecca tomorrow in the pilgrim ship Tyndareus, …600 pilgrims will embark from Singapore, while another 1,234 will join the ship at Penang,’ and ‘embarkation of pilgrims from Singapore will start at 2.00pm’. Another from The Straits Times (23 July 1953, p. 7) reported that ‘the 11,346 ton pilgrim ship Tyndareus arrived in Singapore yesterday from Indonesia with a record number of 1,710 bound for Mecca.’ So, it seemed that pilgrim ships would make multiple trips between this part of the world and the Middle East for the yearly pilgrimage. 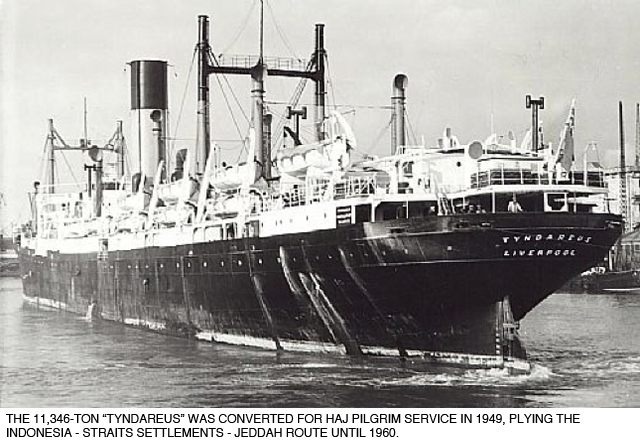 Besides the ‘Tyndareus’ of the Blue Funnel Line, there were two other ships in operation for transporting haj pilgrims from Malaya, the ‘Anking’ and the ‘Anshun’ (both owned by the China Steam Navigation Company). 1. ‘Tears and a Twist’. The Straits Times. 11 September 1953, p. 12. 2. Raffles Library and Museum (1945-1960). Singapore Infopedia. National Library Board, 2006. 3. Tanjong Pagar Railway Station. Singapore Infopedia. National Library Board, 2007. 4. Anthony Green, Our journey: 30 years of haj services in Singapore. Singapore: Majlis Ugama Islam Singapura, 2006.